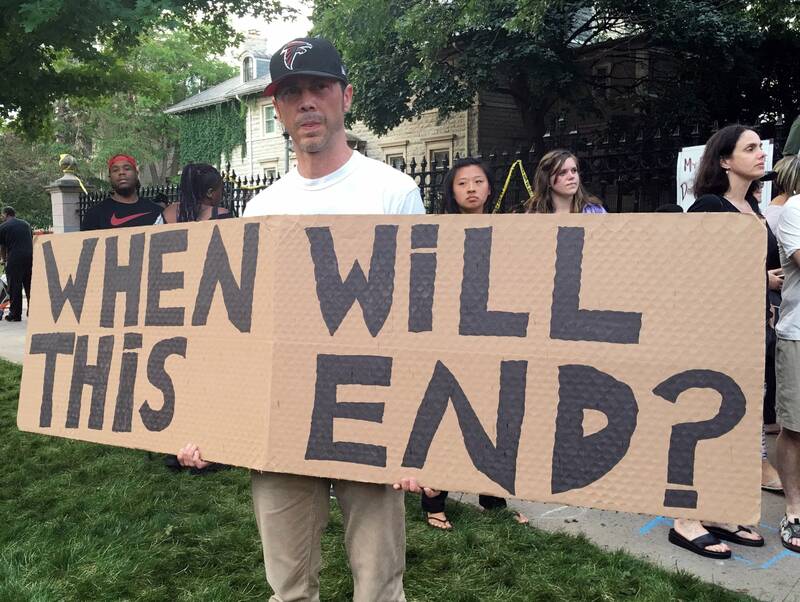 John Ball hoisted his 6-foot-wide cardboard sign with the words "When will this end?" 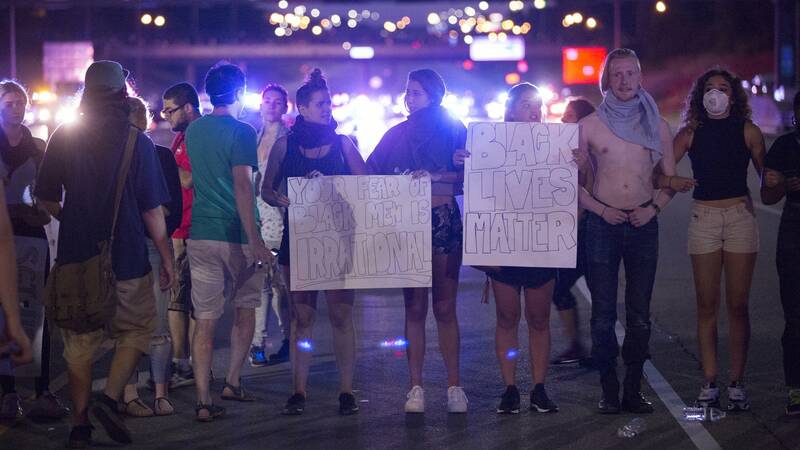 and stared down St. Paul police officers on Interstate 94 as he and other protesters closed the highway for hours Saturday night. Ball, 37, from Minneapolis, escaped arrest but not before feeling the burn of pepper spray in his eyes. And it was all for a cause that isn't necessarily his. Black Lives Matter's white allies, like Ball, are so impassioned they've often outnumbered blacks at recent Twin Cities demonstrations. The social justice community was still reeling from Jamar Clark's November shooting death at the hands of police when Philando Castile's last moments were live-streamed on social media after he was shot and killed by a police officer last week. Castile's death came less than 48 hours after a another black man was shot and killed by officers in Louisiana. "It's just too much," said Tim Myers, a Minneapolis resident. "It's like each shooting is more brazen. It's like they really don't care." Myers was among protesters who stood vigil outside the Minneapolis Police Department's 4th Precinct last year to protest Clark's death. 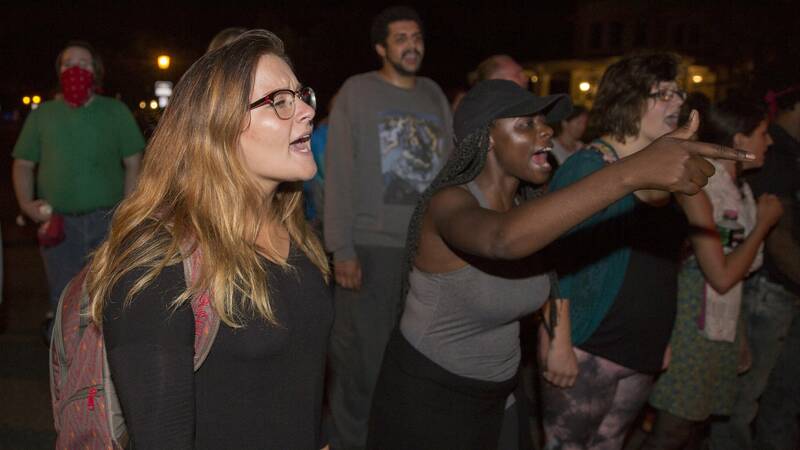 Friday night, he joined a crowd that had gathered to demonstrate in front of the Governor's Residence in St. Paul to protest Castile's death. 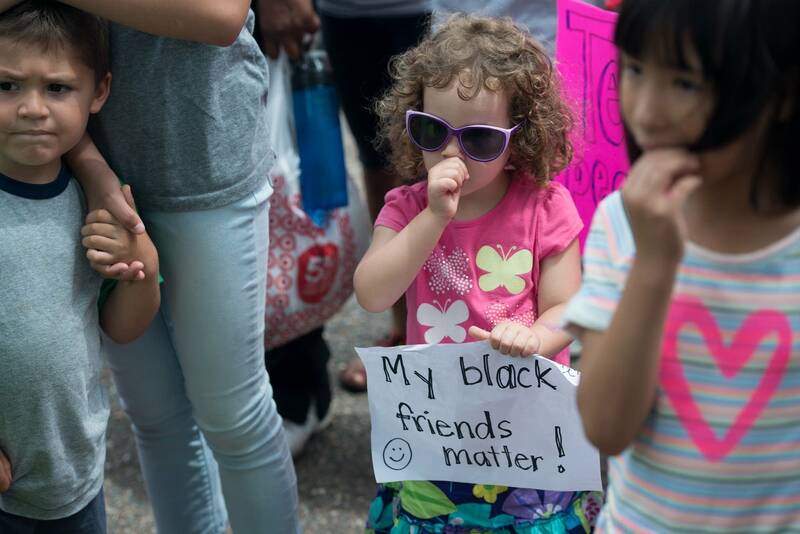 "I think it's wonderful that members of our dominant culture are actively engaged in the fight for racial and social justice," said Nekima Levy-Pounds, president of the Minneapolis NAACP. While the efforts of whites are generally autonomous, they are also part of a delicate, coordinated local and national movement largely sanctioned by black groups to advance their agenda for social justice. "There's been a very direct call by Black Lives Matter folks and other peoples-of-color-led organizations for white folks to put ourselves on the line — standing in the place of peoples of color at demonstrations, potentially putting ourselves in harm's way by getting arrested and facing police brutality," said Tim Wise, a national antiracism activist and author. In fact, only seven of the 46 adults charged with third-degree riot in the I-94 shutdown Saturday appeared to be people of color. And it was white protesters who were largely responsible for Wednesday morning's shutdown of I-35W. Black Lives Matter issued a statement after that demonstration, declaring its alliance with the coalition of non-black protesters. While "protest fatigue" could be a factor for the relatively low turnout of black demonstrators, the lopsided attendance may not be a bad thing for movements, observers say. History has shown that change happens when whites become the face of a problem. 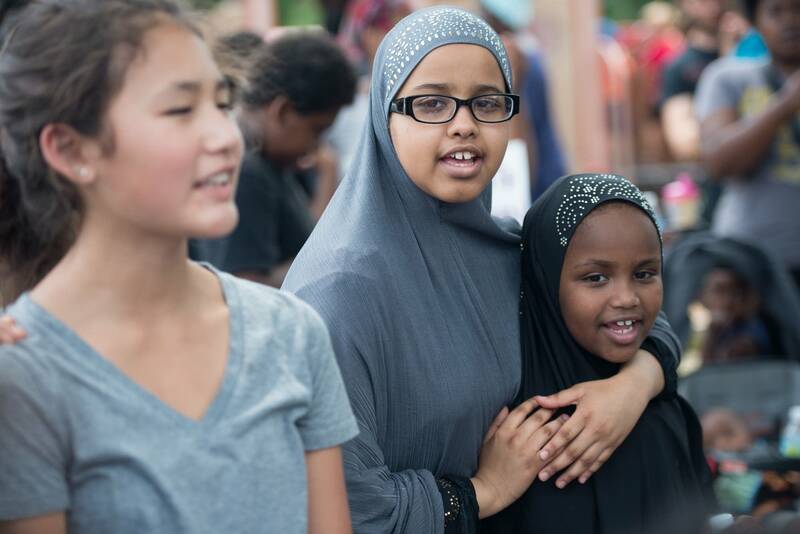 "One wishes society could respond urgently to every issue without looking at who's in the demonstrations," said William Green, a history professor at Augsburg College and former Minneapolis Public Schools superintendent. "It's outrageous that hasn't been the case." Green and Wise agreed that the Civil Rights movement gained national media attention — followed by legislative changes — when the children of northern whites became more involved. When those newfound activists became victims of the same atrocities that had plagued blacks for generations, the nation noticed. "Sadly, as we know from the history or our country, until white people begin to be affected directly by these injustices whether that's being arrested or, in the case of the Civil Rights Movement, being killed, a lot of other white folks didn't pay attention," Wise said. "And that's an unfortunate historic truth. So white participation raises the stakes for White America and causes white folks who might be inclined to sit on the sidelines to realize this is an issue that does affect us." But activists run the risk of being stereotyped as "white saviors," overshadowing years of grassroots foundation-building by African-American organizers. So while whites have been increasingly more visible at recent demonstrations, there's a conscious effort to keep their roles more supportive in nature. Showing Up for Racial Justice — a national organization that educates and mobilizes whites to become activists — has more than 150 chapters, including one in the Twin Cities. The local arm has been credited with aggressively recruiting protesters and populating demonstrations. But you won't see organizers at the mic. They don't do interviews. "Being an ally doesn't mean you have to raise your voice louder than those already speaking," said 22-year-old Rachel Scarlett, who was visiting St. Paul from Canada and joined last week's protests at the governor's mansion. "As white people, we are privileged because we already have platforms to speak out. Our role here is to be supportive, [to] offer support to the powerful black voices that are speaking out." At this point Ray Lewis, 59, of Minnetonka, has lost count of the number of times he's chanted "Black Lives Matter" at various rallies, but "I've never had to talk to my sons about how to behave when you're stopped by police," he said. "As a white man, racial profiling and police brutality have not been my experience. My interactions with police have been positive," he said. "But this is not about color. Any human with a beating heart should be out here." 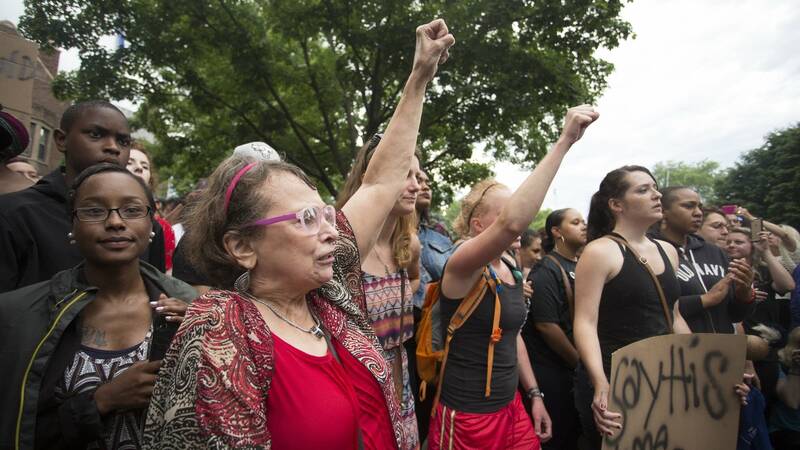 Some whites are showing up at demonstrations on their own or through their affiliations with social justice or religious organizations that espouse racial equity. "As a faith community, we're on a journey of really looking at race, racism and whiteness through the lens of our faith," said the Rev. Justin Schroeder, pastor of the First Unitarian Universalist Church in Minneapolis. "It's becoming more and more obvious to many of us in the congregation that if we are truly going to live our faith and take that seriously we cannot live in a world where the racial disparities that are around can exist." Members of Schroeder's largely white congregation of 900 have been regulars at protests dating back to local demonstrations held in response to the 2014 shooting of black teenager Michael Brown in Ferguson, Mo. While whites may not have experienced police brutality or racial profiling, some are aiming to upend the root of all racial disparities — the notion that whites are superior to everybody else. "I think this is a problem created by white people and perpetuated by white people that directly damages black people and other people of color," said Rachel Wannarka, who lives in Minneapolis. "Clearly, we are what's driving this problem and we have to be a part of the solution." Wannarka and her husband, who is also white, are members of Minneapolis NAACP and parents of two sons: one black, one white. She's also protesting so her boys won't live in parallel universes. "Every indicator of quality of life demonstrates that our system doesn't view all people as created equal," she explained. "I have my white son and my black son, and they're both young children and they both get hyper. 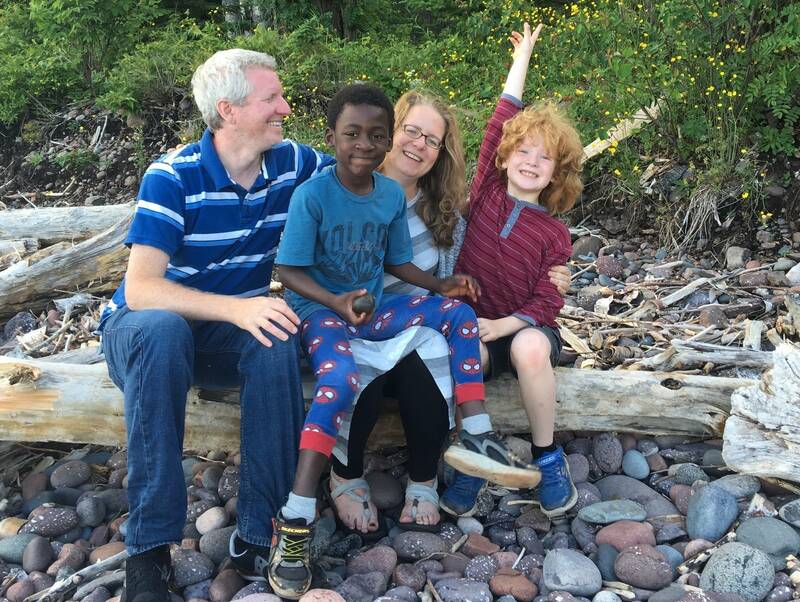 My white son gets a lot more of the 'boys will be boys' [look], while my black son gets a lot more of the side eye at Target." Myers, who has joined demonstrations since Jamar Clark's death, said he knew for years that African-Americans faced discrimination. But it wasn't until he began working in north Minneapolis and broadened his social circle with friends who are black that he was motivated to join protesters at the 4th Precinct. 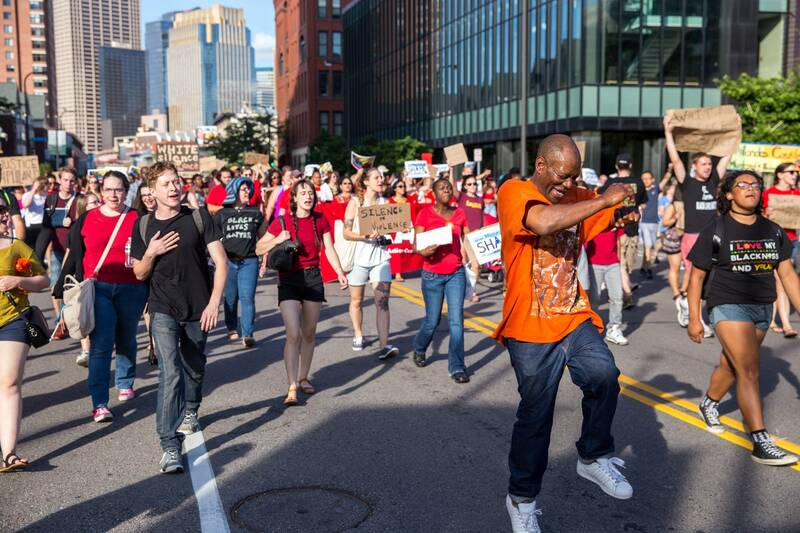 "It's different when you read about it from your white neighborhood than when you actually work in the neighborhood and see how it affects people who knew Jamar," he said. The 4th Precinct demonstrations attracted a largely black but still diverse group of participants. But the rallies against the death of Philando Castile have been overwhelmingly white with sprinkles of color. The Rev. Jesse Jackson said he was pleasantly surprised by the racial makeup of the crowd he rallied during a visit last week to Minnesota's Governor's Residence in St. Paul. "When people see you here in Minnesota — black and white, young and old together — you represent the best in us," he said. "You represent the best in America. Dr. King would love to see you today." Shane Ransom, 49, of St. Paul, said he's happy to see so much support from white activists. "There's been white people fighting with black people since Quakers and Abolitionists. So this isn't the first time in history that white people have done it. They've done it to help us get out of slavery and get into the north. It's good to still see that, the spirit of them here," he said, pointing to several white supporters also gathered outside of the governor's mansion last week. "There's a large number of whites, and without that number of whites, this situation would be totally different." Robert Holden, also African-American, and at 32 the same age as Philando Castile, agreed. "I'm actually not offended by there being so many white people here," he said. "I'm happy there is a turnout of supporters of different races." Mae Flowers arrived at the governor's mansion last week with heavy heart after stopping at the site of Castile's death. She scanned the crowd for fellow African-Americans. "I would love for our black community to be here. As many as possible," she said. "We need to take a stance. We need to come together." But William Green, the professor from Augsburg, said blacks might be sidelined by "protest fatigue." "For black people, it's a sense of continuum — that which was, is. And that which is, will be," he said. For whites, it could be a novelty. But the approach of SURJ MN is refreshing, Green said. 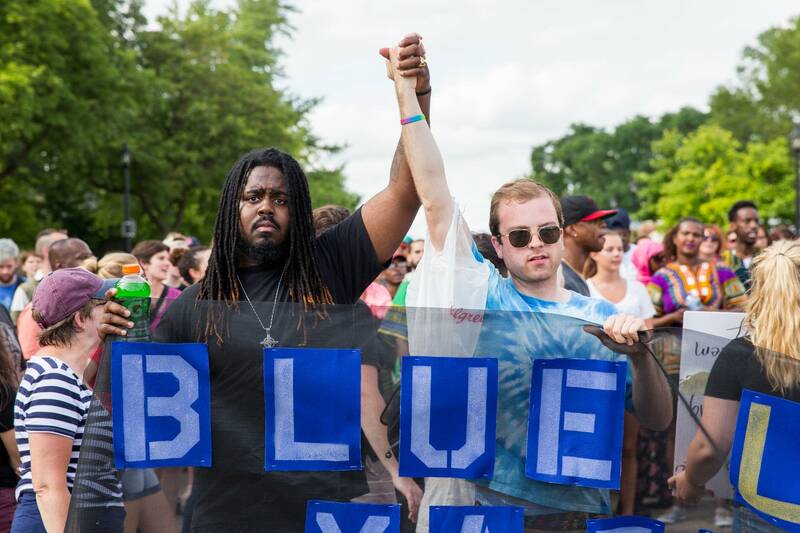 Since Ball garnered social media attention with his oversized sign, white friends have questioned his involvement. "Why are you doing this? It has nothing do with you," he's been told. "Are you trying to be cool or something?" But Ball plans to start another SURJ chapter soon because there were also friends who said: "Why didn't you call me? I would've loved to join the protests." Editor's note (July 14, 2016): An earlier version of the story was unclear on the wording of John Ball's sign. The story has been updated. Emma Sapong is a reporter for MPR News.